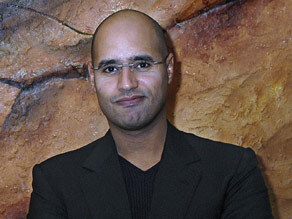 Saif Gadhafi is the son of controversial Libyan president, Moammar Gadhafi. Saif Gadhafi answers your questions. An architect, he graduated from the London School of Economics with a PhD in 2009. Despite occupying no official position in the government of Libya, Saif is seen as a powerful player both in the country and abroad. He has performed in numerous public relations and diplomatic roles for his father. Although he has been mentioned as a possible successor to his father, he says that Libya's future lies in direct democracy. He also played a central role in efforts to release the man convicted of the Lockerbie bombing, Abdelbaset al-Megrahi, even accompanying the terminally ill Megrahi back to Tripoli when he was released on compassionate grounds. Today he runs the Gadafi International Charity and Development Foundation which aims to protect human rights, develop civil society and promote charitable work. Hi, Saif, I'm an American educator writing in from Malaysia. First, I've seen interviews with you and you seem wonderful. It's lucky for Libya that they have you. Now my question: It seems that the majority of large and small current suffering and problems is due to vast numbers of people–often in very hard-to-reach places all over the world, including the developed countries–not being well-educated/developed, as in being fully able and motivated to properly investigate matters for themselves and take action, whether regarding their own profession, what their countrymen are up to, the state of the environment, etc. If only the elites are well educated, the vast majority of problems won't disappear, due to the non-elites continuing to cause problems AND the educated elites causing their own brands of problems without any check from the masses, who remain too ignorant to check the elites. What are your thoughts on this matter? Do you see any interesting ways to finally really reach through and develop and educate the real majority of humanity? Libya has made great strides toward changing its image to the world and has come a long way in terms of global engagement and reform. Do you believe this trend will survive your father's administration? Also do you believe Libya is ready for the democratic future you mention. What would be Moammar Gadhafi, if Libya has not had the Africa's largest oil reserves? Would've he been gone long time ago? would Libya more democratic? Why have Libyan people been paying billions of "their money" for his father extreme makeup from a mad dog to an a good ally? What if Gaza has the Asian largest oil reserves? I bet, Hamas will be the closest American Ally too. Shame on you greedy Americans. If talked Libyans instead of Gadhafi and his family members, definitely it would be very appreciated by poor Libyans. But you are the oil biggest sucker in the world and I understand that. Why is it that in all Muslim countries (from AtlanticOcean to Mediterranean Sea to Gulf Ocean to Pakistan), the ordinary Muslim citizen has no respect for its rulers. In fact, absolute loathing for the rulers. And plz don't tell me that corruption exists in Western countries – it does but the level of hatred that the average citizen in Arab countries feels towards its rulers is on a different level. You probably do not mingle with your citizens and listen to psycophants who constantly tell you how great you are. Muammar Gaddafi – King of Kings !!!! Isn't that how he describes himself. He is a joker who is out of touch with reality. You have been very outspoken on the plight of the Palestinians, speaking out during the Gaza War and sending a letter to the German chancellor questioning her country's role in supplying weapons to Israel. Can we expect that you will be at the vanguard of the new generation of Arab leaders who will finally stand up for the Palestinians and help to resolve this long conflict? If human rights is that important to Mr. Saif Gaddafi, why is he not working for the right to stage free democratic elections in Libya? Where does he stand on the issue of human rights and what is his definition of what a civil society is? If he holds no official position in the government of Libya, are we to assume he is to Libya like Saddam Husseins sons were to Iraq??? That is to say, even with no "official" title, are people as scared witless of him as they were of the two "prodigal" sons in Iraq? (1) Education: You are an educated man, of course you know the value of education to your country, and you would like Libyans to be educated so your country can stay competitive and diversifies its economy. However, I have seen very little done in the area of education from your foundation. To mend the relations between Libya and USA, I think you need to encourage American Institutes to contribute to the building of this important sector. I have some proposals for you, if you are interested. (2) Peace: Dr. Khalil Ibrahim the leader of the biggest Darfour movements is in the hospitality of Libya these days after been unfairly ejected from both Egypt and Tchad. Many international organizations, Arab, and African neighboring countries are enforcing him to talk to the government of Sudan in Qatar. It is totally unfair treatment and I strongly believe that Peace cannot be attained this way. I do appreciate that Libya welcomed him without showing any alignment neither with him nor with the government. This is called wisdom and thank you for that. I would like to ask that Libya should remain neutral and facilitate his way out to his people at the front in Darfour, because that is his right as a human being. Secondly, I suggest that your organization should take over and facilitate peace talks due to its good relations with both the government and Darfour movements. Qatar remains untrusted after it clearly shows its support to Sudan government. I appreciate the fact that you are truly interested in a growing stable Libya and that you are a supporter of international human rights. I wonder if you ever address your brother Hannibal's internationally documented abuse of household staff and others. You two seem like direct opposites and I am just curious to know if you ever try to address his behavior as part of your belief in human rights and the negative effect that this continues to have on your country and it's people. Thank you. What is your perspective on the future of the United Maghreb Union? Do you see any hope in resolving the conflicts in North Africa to allow for the creation of a united Maghreb? I also know that the Libyan government has done a lot recently to attract foreign investments, can you discuss the progress of foreign investments in Libya? and what are the monetary and fiscal policy changes Libya has made to grow foreign investments? I am Mozambican and also an architect, I'm 39 years old, so I am from the generation that grew up with Samora and believe in Him and grew with some fascination for strong statesmen like your father and Samora. For me, Africa today has less and less charismatic leaders who can show their people the way and set an example of behavior and be strong in defending in their countries interests. Usually power is just a platform for personal enrichment, etc. How can we turn this around and change the future of our continent? I believe a western democracy is not the way, since most elections in Africa are not fair and usually "favors" those who are in power and the situation we have in Zimbabwe for example is definitely not in Africa's interest. I have admiration for the work you did with ex terrorists and i think you are one of the hopes for this continent, not has a leader of your country but as the leader of a stronger African Union. Assalamu alaikum Saif. I am a Malaysian writing to you just to share what most of us Muslims having a very thick negative thinking towards the rich and powerful Arab-Muslims living in luxury where just around their corner,brother and sister Muslims don't worth a single riyal or dinar living and dying at the hands of the Israelis.At least when I read something about you,tears coming down and at the same time I asked myself,`Is this the one Allah sent to overcome the problem of our fellow brothers and sisters?I may be wrong,but to remind myself and all Muslims esp. you Saif,because of one girl being bullied near Kaaba by Musyrikins,Prophet Muhammad s.a.w.,nearly declared war just to save one life.I shall be waiting for your comment on this one biggest issue which if solved,I think everyone should be living in peace throughout the world.Wassalam. I was very impressed by the speech you gave recently at the American University in Cairo regarding Libya's future. My only concern was your comment that the "problem with Libya" is Libyan women who have been educated and later decide to stay home to raise their children and care for their families. This is a phenomenon that we in America are experiencing as well, and I do not think it is necessarily a bad thing to have well-educated mothers raising families full time. Are you willing to work with Libyan employers and legislators to ensure that women who decide to take on professional roles are given enough time to care for their families and raise their children in such a way as to make them upstanding, responsible members of society? What are the labor protections for women who want to work but also want to marry and have children? Is this against Libyan cultural norms? Also, what is the state of the arts in Libya? Do you have any plans to encourage the creation of a theater, ballet, and opera in Libya? How about the development of the film industry? Thanks and best wishes for continued success in your future! I am western educated man ( masters degree in business and management from a top Uni in UK). You seem like a man who could influence people plus i have some ideas on furthering human rights. Do you consider yourself not a corupt like your father? My second question: you are spending too much money everywhere on everything, from where do you get all the money? –	What needs to be done to realize One world under God, Indivisible, with Liberty and Justice for All? –	What needs to be done to really Stop Terrorists, Nuclear Weapons and Other Weapons of Mass destruction Worldwide? –	How can we all make Africa AIDS and HIV FREE? –	WHO will win the South Africa World Cup? I am awaiting Saif al-Islam Muammar al-Gaddafi’s replies. how long will your father rule Libya with iron first and after his death will you be crowned king of Libya like that of Basha Asad of Syria. I was wondering if you were planning on doing anything to ease the visa restrictions in Libya. It truly is a beautiful place that has a lot of amazing history, that I am sure many would want to see. I am an American who has been to Libya several times and have directly witnessed the corruption, the manipulation of the laws, and the forced nationalization of a profitable Libyan company. At the same time, I have seen the warmth of the Libyan people in their willingness to welcome foreign businesses and cooperate with them, and their sense of brotherhood with those they find trustworthy business partners. I humbly ask what you are doing and will do in the future to protect the rights of local and foreign businesses? How will you provide a society where the legal system can guard against corruption as well as stimulate business? I am excited to see Libya enter the new decade as an exemplary nation for many African countries, especially in providing an open market, a more transparent legal system, and better lives for Libyan citizens and foreigners alike. Thank you and I bid you success, inshallah. My Question is a simple one, why do libyans prosecute and kill innocent africans trying to make a living in Libya? and why is there so much red tape around leaving Libya, because anyone that wishes to leave libya for lack of interest to stay on that country doesnt mean he or she is working for the Israelis and therefore should be taken to the desert and shot to death!! As a Libyan student abroad, I am just wondering what sort of direction you want to see the Libyan economy taje, and more specifically, what is your grand vision for the Libyan equity markets and its banking system. Writing in from Belgium, I would like to first congratulate you on your fine work at the charity. It must not be easy to be under the constant pressure of the world's divided opinions of your father. Caring more about the sociological aspects of your life, rather than the achievements (which can already be found in many ways on the net), I was wondering how you deal with people that are against your father. Does it impact your work, your life and your family? Thank you in advance for your answer and I wish you the best of luck in all your current and future projects. As simple as possible – do you believe that the Jewish people have a right to their own homeland somewhere between the Jordan river and the Mediterranean sea? If possible, as you are not a politician, a simple "yes" or "no" will suffice. First of all, congratulations on your PhD! My question is this - can we expect that your country will recognize Israel's right to exist or do you support the stance of your father? What are your thoughts on the place of Israel in the middle East, are you ready for peace? I don't expect lecture about "evil Zionists", just an honest answer to the above question. The world owes you a great debt of gratitude for the momentous achievements you have made in tackling Islamic terrorism and I hope you will be honoured soon with the Nobel prize you deserve! Firstly, considering your success in encouraging the Libyan Islamic Fighting Group to write a new jihad code, how hopeful are you that this Islamic code of ethics can influence Islamic terrorists around the world, bring to mind core Islamic and humanitarian principles and bring an end to the spiral of extremist violence? Secondly, in the first centuries of Islamic culture, there was a strong emphasis on the need to embrace reason, in terms of philosophy and science. There seems to have been a certain crisis over the past few centuries in Islamic culture, between reason and faith. If in the West, there has been a dominant rejection of faith in favor of pure rationality, expressed now as Secularism, in Islamic countries there has been a growing and opposing Fideism, a suspicion of the demands of reason, in favour of pure faith. What steps can been taken to encourage a dialogue between both cultures, so that a more moderate philosophy that embraces both faith and reason can be fostered? Thirdly, is there a need for a Caliphate or some central Islamic authority, in order to define the principles of Islam, in the face of the modern world, such as what the Hadith did for the 9th century world? Do you have any input in releasing the Swiss hostages which have been kept in your country? It certainly would help the relationship between Lybia and Switzerland. has anyone been as far as decided to be more a like ? anyway your dad is awesome please say hi to him from me. I worked in Tripoli for almost a year. I found that Libyans have affinity with Europe but, there seems to be some mistrust too . Geographically, Libya is very close to Europe. Historically, culturally and economically, there are many links. Do you think Libya will/can establish a close and thriving relationship with Europe like Turkey for example ? the euro countries held down by money and population problems. china about to enter the bust part of there historical boom and bust history. the americas led by brazil and the u.s. shifting energy policies. the middle east/north africa population,water and low oil price problems. libya, whose tribal leaders are only as well off as the price of oil and whose small population is never well off. how do you see your country navigating the next twenty years? of the house of saud. i was hopeful but haven't heard anything since. I am very much impressed by your work . Accordigly you will be in a race for Noble Peace Prize . God bless you . All the best for your success . I am an Indian from Panama, you and the whole world knows that my country India is the biggest democratic country in the world, so therefore I would like to see democracy in your countries, and in other undemocratic countries, because Mr. Saif, in democratic countries you have all kinds of liberty, like freedom of speech, freedom of press, etc, The economy flourishes in a democracy, Almighty God created man freely, so I think nobody has the right to suppress mans freedom, now I would like to know if you are interested in power, and if you really occupy your fathers place, will you bring democracy in your country. Is Libya safe to visit for an American Jew? I am from Saint Louis, Missouri. I am worried that a country that has not expierienced democracy, would get hi-jacked in a few election cycles by an organized plotical group that has no intention of allowing true freedom to continue. That is my biggest worry about your noble desire for your Country. Having a government that tolerates its detractors and opponents, and encourages peaceful discussion and respect of differing religious viewpoints is always a plus in this chaotic world. I hope, with your vision, you have a majority of Lybians willing to help ensure democracy flourishes for centuries. Will you attempt to normalize trade relations with past trade partners such as Turkey, that had been stifled during the US Ambargo on air travel to Libya? Such things as paying the delayed contract payments of Turkish contractors in Libya etc. I don't have much to say except for the fact that Libya has lost time because of economics sanctions in the field of development and industrial revival, how do you plan to catch it up. I appreciate work done by you in bringing Libya closer to other socities and world community. I read above that you escorted the 'lockerbie bomber' back to Libya. If libya is truly a progressive nation, seeking peace and a place in the modern world how can you (and Libya as a whole) condone this man and his actions? or even be seen to be supporting people like this? You are clearly a very educated man – if a plane was be blown up and land in Tripoli.. would you support the release (and subsequent celebration) of the bomber as you have with Abdelbaset al-Megrahi? Do you only criticise what you have called 'Terrorist actions' (Israel's actions against Palestine) when they are against Arab nations? I am both an American & Lebanese Citizen. I work in the Telecom industry in the Middle East. Although I would love to do business in Libya, I find it nearly impossible to even obtain a visa to your country. With your outspoken comments and that of your father that you want Libya to open up to the world, is there any plans to ease up the travel restrictions? Keep doing your good work and I know you understand the value of Democracy and human rights, and hope you will do your best to achieve these for Libya. Best of luck and respect. May Allah's blessing of good health and long life be with you! I had the pleasure of covering your visits to the Philippines and meeting you. But I'm sure you may not remember me. Many Moros tried to meet and shake your hand. Libya has been a consistent strong supporter for the welfare and struggle for self-determination of the Bangsamoro people, or the Muslims in the Philippines, variously cited as 4 to 10 million. Your country's support dates back to the mid-1970s at the height of the independence struggle of the Moro National Liberation Front (MNLF) headed by founding chairman Prof. Nur Misuari. Your country or government's support under the aegis of the Al-Fateh Revolution Leader Muammar Al-Ghadafi is also true for the Mindanao peace processes to find a lasting and just peace in war-ravaged Southern Philippines. I would like to ask you: What is the future Libya's support for the Mindanao peace processes? In your eyes, has Libya's support that included millions of dollars of development funds for Mindanao and the Muslim community's all worth it? Do you still feel that Libya should continue her support for the search for peace and effort to improve the Moros' economic condition? Shukran and Allah bless you! With all due respect, why is Libya holding Swiss nationals that have commited no crimes. This does not seem to be logical consequence of the Geneva incident with your brother. And by the way since the Kadhafi family has a long history of receiding in Switzerland. Does your brother Hannibal also have Swiss nationality? If this is the case than he has to be treated like a Swiss national. With all due respect the Swiss should be liberated immediately and allowed to return to Switzerland. What are your thoughts on this contraversial issue? 1)Would you take the initiative to provide sensible leadership to the Muslim world knowing that there are much idiosyncrasies in the current leadership in most of the Muslim countries and getting them to agree on common platform for improvement is a mere impossibility? 2)What effort would you take to influence the economies of the Muslim world to be a significant force in the future world economy without the leverage of oil as a currency? 3)What kind of team would you assemble to assist you in the above effort if you choose to commit to it? The prophet was a great man because he proned learning, compassion and many other vertues.Are woman of Libiya given the same opportunities to have education as men since they are the mothers and future mothers of the next generation and also their first educators? Hey Son of a Gun, ( suits your back ground. Does it not ? ) Why does your Lunatic father, force himself on the people of Libya to pretend that he has been " elected " as the President ? I was in Libya around a year ago. Almost 99 % of the Libyans hate your psycho dad, though they dare not say that in open ! Your Dad and your family have completely messed up your country, like there is no tomorrow. What is your reaction to the above comments ? Were you there when American Bombers attacked your father some couple of decades ago? And if so, how did it feel to have things just start blowing up around you? More to the point, how do you think it felt for all those aircraft passengers to blow up in air? Was that "compassionate?" How then could you seek a release of a murderer on "compassionate" grounds? You are lucky I am not in charge of US policy. You would be visiting your father's gravestone instead of giving aid and comfort to terrorists now. But, the wheels of justice grind slow...but they do grind fine. Alls well that ends well. We look for an nice ending over there in Lybia. Jim – Mexico – if you want to run past the gaunlet of narcos to bomb me. Sadat changed the world by extending the hand to Israel in peace, even if Egypt and Israel fought many wars, and were bitter enemies. Your father is a brave man. When will he go to Jerusalem and offer his hand in peace? Mr. Gadhafi, can a tent be architectured in form of two camels facing each other? I think that this might do for a award winning project! Imagine this being a Camel House from which your father could govern, like the White House in the U.S., or the Pink House in Argentina. Let me know if such project is feasible. You can name it after me, the desert voice. Saif, your country has a fabulous untapped potential for tourism by westerners due to the beaches and history of your country but the potential will never be tapped as long as your country continues with the same old policies. Is there any hope that Libya will change in the next few years? It could be better than Dubai for instance due its close proximity to Europe but westerners expect a more liberal regime than you have now. i quite like and appreciate the manner and way you have been conducting affairs in libya. you have positioned yourself to take charge whenever your dad step down. i also appreciate the manner you have handled the issue with the enemies of your father, you have played a wonderful diplomacy. could you please accord christians the right to build churches and worship freely in your country? secondly, could you please support my organisation (baal perazim) i want to build affordable homes for the poor and widows in the niger delta of eastern nigeria as well as granting free scholarship to those in need as most this people cannot read or right due the fact that they are poor and cannot afford school fees. As an American working and living in the middle east, I have always wanted to travel to Libya. One of my Canadian friends has traveled there and his opinion was favorable. However, it is my understanding that Libya requires an official Arabic translation of any non-Arabic passport. It is also my understanding that Libya is the only country in the world that requires this translation to be performed before a visa can be issued. Will Libya soon relax this restriction that seems aimed at keeping non-Arab tourists out? Also, will Libyan tourism visas be more accessible to American citizens? Wishing you all the best for a prosperous Libya. Good day , hope you are keeping well , i am writing from the Middle East where we are facing a tremendous problems nowadays , due to Iran's irresponsible allegations and bad political conducts of some countries such as Iraq and so on , the image of this part and your country is not satisfactory in the West , i wish to know what is the constructive action that Lybia is going to take in connection with this matter , and if your esteemed Government is going to have a free parliamentary elections in the near future , as you are fully aware that , we can not isolate ourselves from the international community and we need to move in parallel with the international political and social demands , as per my assessment Lybia is taking the right path at this stage , thus i wish to know more about the future of Lybia and the adjoining countries as well , thank you very much for taking time to read my letter . I have been a strong supporter of your father's philosophy about the future of muslim ummah in Libya and elsewhere. I have earnestly followed his endeavours to transform his nation and the islamic communities elsewhere into a modern communities encompassing the universal values enjoined upon mankind by Islam. As you know, your father"s and my generation are beyond our prime and in the process of handing over our achievements and failures to the appropriate inheritors. As an upcoming and growing individual, when you are readying to take over the responsibilities, how do you find yourself situated in the prevailing situation, when you look forward to becoming a successful individual, libyan and human being. Hope you are fine and doing well. Sir, I request you to think and do something for the betterment in the education sector of Kashmir. I belong from Azad Kashmir and I've mission in my life to spread the quality education throughout the kashmir but i don't have the resources only i've the hope. Hope you'll consider my request and give me your positive feedback. I'm waiting your response in my email. I salute the public and diplomatic roles you played in recent times for your father Dr. Moammar Gadhafi of Libya. Its crystal clear that your father has a voice in that geographic piece of land called Africa. Dr. Moammar Gadhafi made an assertion early this year in a function. That the only way the country Nigeria could become better is for it to be divided. This spurred a great deal of controversy within and outside the shores of Nigeria. It does not require rocket science to know that Nigeria had weathered some storms lately which inspired Dr. Moammar Gadhafis statement to the best of his knowledge. As regards the country nigeria becoming a constructive state tommorrow. If you where in your fathers shoes. What would you do? Erewa K. Mene writes from Lagos Nigeria. Of the many symbolic icons in Libya, Great Man Made River can be considered to be on the top of the list. Given that this was conceived almost half a century back, it still remains and serves as the vital network to the people in your country. Do you plan to have any similar visionary structures? my name is Britta Umm Hassan Elayan, writing from Hamburg/Germany. In 1981 I wanted to immegrate with my Palestinian husband from Jordan to Lybia. Admiring your laws of woman rights, legal protection of expectant and nursing mothers, your social housingprogramms. Unfortunately your father changed and deported palestinians; I stayed in Germany. Talk to your father! He was on right way! And do not forget pressure on woman inside arab family. Do not forget pressure of Qur´an on woman. What about honour killings in your country? It is not enough to pass new laws; Society have to accept, to follow. It is not enough to make a speech. Your behavior will be an example. First, I must say how impressed I am by your philantropic work and personal accomplishments. Being the son of a highly contraversial and most misunderstood public figure musn't be easy, but you perhaps grew even more determined to lead your life and be a leader and example to others. Regarding your father, I believe he has done wonders as an African leader, helping sub-saharan Africa in so many ways. I've worked in tourism in Tanzania, and your father is very popular there. Do you believe, that developing tourism infrastructure in Libya, will consequently a means of attracting foreign investment in your country? Would this seem to you a step towards strengthening ties to Europe – let's leave xenophobic Switzerland aside – and opening up politically? Im just curious, why do your fathers comments contradict his actions vis a vis African integration...by the way, I think his comment on Nigeria was spot on. I'd like to know the following: We don't know your father's private persona, how would you describe your father as a man and as a person? Are there times where you've reacted to anything he did/said with a "he shouldn't have said that'? Or is he just your father to you? what about spending ski holiday in switzerland? (1) When will a clear and righteous vision be communicated with the Libyan people? A strategic vision that delivers value and hope to them; that is concise as well as effective in reflecting what is best for Libya. If one is communicated today and invested in heavily, we could be competent two generations later around 2030 – why delay things further, it's a long wait already! (2) When will a democratic vote be held that gives a voice to the people of Libya to elect whom they feel is in their best interests to lead them? When will people lead the leaders and not vice versa! (3) When will power be stripped from those who don't deserve it and distributed effectively in Libya? There are many who are more talented, capable, educated and patriotic towards Libya; than those who are in positions of privileged leadership in Libya today... including yourself! (4) When will sectors like health-care and education that are of value to the common Libyan citizen be invested into? Why are all the current priorities given to oil & gas, infrastructure, banking, etc... which are of value to the Libyan elite only! When will a clear vision be communicated with the Libyan people? A strategic vision that delivers value and hope to them; that is concise as well as effective in its implementation. his Libyan Opponents gunned down in European Capitals in the early 80s,including the shooting and murder of Police Constable Yvonne Fletcher.Apparently you seem to be following in his footsteps. about your father's tyrant regime. After today's action you will be regarded and looked upon as another fascist whose main aim is to silence dissenters at any cost. take a step back and consider carefully if they should stand by a ruthless thug who operates in similar fashion to his father. You definitely don't come across as a Leader or figurehead as you neither possess the qualities,character not the charisma. be able to perform a much better job than you. I am sure that if you were to hold elections tomorrow with an opposing candidate,you will only be able to get not more than 12% of the total votes. when your father lounced his revoultion he sounded just like you now exactally tha same talking about libyans and their need and that we are all equal n no tribes no sirnames we are libyans .....my question since the beging of both of you is the same ...will you end up like him having no concern about libyans and people around you will get richer n stronger ?? another question you are focising on tha transforming of libya bulding hotels and towers where is the majorty of us are under the poverty line so who will go there maybe you and people you and your father made dont you think?? First of all I congratulate you in advance for taking your father's posotion in the near future. Why does Libya's wealth go to other countries while the Libyans are in need of this money. Homes should be built to the poor libyan people and jobs should be provided for every single Libyan. Now the people are only thinking whether their homes will be demolished and where should they go. Some othersare taking this opportunity to make money, i.e. they take advantage to sell properties gaining a lot ofprofit. So for goodness sake try to make a solution to all this nonsence. Help the Libyan people first before going to any other foreign countries who are seeking help. I hope that this will be executed in the very near future. Possible channel responded to the riddle of the Libyan newspaper Oya, and Cyrene and the Kingdom of "Tomorrow's Media" How evaporated in an instant without a reaction from you. How can dispense with the media, especially that through the experience of successful allibiya tv, haw and whay Libyan workers and leave the channel in the street .. How then are the attack on journakist of oea beating amid silence from you. I congratulate you, and I wish you success in your life. First of all thank you very much indeed for all your support to our great country Libya. As you may know, that majority if not all of the Libyan youths support the idea of Saif El Islam to take an official place within the Libyan system by which the Libyan future can be bright. My question is: why do you not achieve our wish since a hugh trust has been given to you by Libyans? What I want to access it now, we all know the cause of retirement proved important to us ... or you know your the same, but why quit without justification position .. and you know that the inheritance of a word the sound of people stole a strong state ... it rational that withdraw because of pressure from the rich and leave the revolution for them, as blind? Two ways it take a man to be a hero. You can be a hero as a man who was fighting for a cause of people and his nation and died on action, or You can be a hero as a man who accomplished an important cause for his nation like former Egypt President Gamal Abdel Nasser. You can't eat the orange and throw the peel away — a man is not a piece of fruit. The case of Nasser is a hero who died in spirit while fighting for the cause of his nation. So, would be when day like hime!! I do not want to start with introduction to thank you for your efforts because you are satisfied (overflowing) from that. My question (confusion) who are you? In other words, what is your executive position in Libyan government that gives you authority to say or to act all your statement in LSE and American Uni in Cairo? If you see yourself has a power and a right to implement all your statement without any executive position and legislative authority, I see you are like your father who can do everything in Libya without any accountability (authoritarian totalitarian power) and he does not have any executive position in Libya’s government. My questions is do you want to be like your father leader and advisor? I am Libyan, why you and your father are against western democracy in Libya? Which kind of democracy you want in Libya? How can Libya stop the corruption in libyan adminstration? I would like to ask you something. If you truly believe in democracy being established in Libya, why would over a hundred of your men outside of the London School of Economics where you held your speech attack a small group of less than 15 individuals expressing dissent towards you and your fathers regime? Why do you guys continue to try and sweep the issue of the Abu Salim Prison Massacre under the rug? Over 1200 political prisoners, who were arbitrarily arrested in the first place, were systematically executed in June of 1996. Im sure you know this already, so why do you continue to ignore the voices of the families of the victims calling for justice? Will you continue to kill innocent people and lead a corrupt government as your father did? Will the actions like Abu-Sleem prison massacre be continued in your rule where 1200 prisoners who never got a trial were killed like animals in a cage? If you claim you want democracy, will you allow a free and open election once your father meets his end (hopefully sooner than later) before you take over? Will people like me, who have lived abroad and have had your father's assassins come after us ever be able to come back to our homes? if you belive in democracy why we dont have democracy in libya, i mean elections let people colect their presedent, we like live in a kingdome country. is not it? You are launched initiatives for young people including the distribution of ground to young people since 2008 and so far no concrete things, how this launch initiatives as well as noted in the recent reluctance of young people to Libya and consider your words like the words of your father. I would like to know how does it feel to be above the law?? I must confess not too many people in the world today can say they are. How does it feel to have a ruthless dictator for a father who ruled with an iron fist for forty years, hanging dissidents in public squares, imprisoning and tortoring their families and ordering the massacres of countless others, without giving their families the opportunity to decently bury their loved ones with a measure of dignity. I want to know what it feels like to be touted a great reformer and have the red carpet rolled out to you preparing the stage for more decades of illegitimate rule with no real elections, no opponents to challenge your platform or question its merit?If Mr. Saif, is interested in real reform in the country, let him have the decency to stand in free open elections allowing others to challenge him. If he is interested in improving conditions for Libyans, let him admit his dad's responsibility in ordering the massacre of many brave Libyans whose only crime is opposing the tyrannt's lunatic views. If he is interested in real justice, let him hand over those responsible for carrying out the massacres. The responses of many people before me only reassures me the superficiality of Safi's rhetoric and the gullability of those who know very little about Libya. As for us Libyans, we know who he is, and we know the atrocious history of his father. We are the ones entitled to seek a future, and we know it will be a better one so long as the Qaddafi clan is not involved. Knowing many Libyans both inside and outside Libya I have to tell you Libyans do not want you or your father or any of his henchmen around, much less ruling Libya under a horrific dictatorship. As for your role, which is quite obvious to present a modern, successful, pro-western image of the supposed new Libya...you and your psycotic father are fooling no one. When will you compensate Libyans (vast majority) whos lives have been ruined by you and yours? When will you all step down, leave with your untold billions and let Libya blossom into the great country is should have been until your hell destined father aborted it and its foreseeable future? Please...just get get your dad and leave the absolute power behind for real Libyans. but with time and effort things can be achived, we are with you. I am very pleased that at last some one could presnt to the world the real face of Libya. This does not mean that others did not try before you , but it is a fact that you are the most successfull so far. However , and as you have said in London yesterday , the road is long for us to become the country that contains all /or most of our desires. It is great that you could visualize and understand our problems , and work towards solving these broblems ,and i think that in order for your work to succeed , we need you to (( KEEP ON GOING FORWARDS AND DO NOT LOOK BACK )). Libya and it's people suffered deeply on the hands of your tyrant , militant father over the past 40 years. Don't you think it's about time for YOU and the likes of you to aknowledge this fact and leave with YOUR family to the TRILLIONS of DOLLARS you laundered abroad before it's too late? Do you know what I mean ? goood luck and ask allah may help you ..
Why, despite all declarations from you and your Father, the Jews of Libya still cannot get a visa at least to visit their homeland? Iam engineer I have been working with Europeans and Americans .i realized many of them are just in Libya to learn and get high salary for not thing are not experienced ,although there many Libyans much more qualified and they get low salary . in addition those idiot foreigners insult your father how is our president of our country and all Libyans which are red line as you mentioned before . I complained to authorities . but they keep their close mouth because they get bribe , the people close to you and your family protect them because they sale themselves as well as they sale our country for a little money . When you and you father stop treatting Libyans as children? Plus when we see the day that Libya is gree from the "G" factor? What would you say to those claiming that most of what you are trying to do is just a well choreographed charade by your father and his old guard and you? Many people, especially educated young men and women are frustrated by how little actual positive change has happened inside of Libya and are really in doubt of your true intentions. This is especially because they see you speak out all over the world except inside Libya. Moreover, many think that you have served your true purpose, from the old guard's point of view (Lockerbie, the Bulgarian nurses and the Islamic Fighting Libyan Group etc.) and that there is no need for you anymore? Finally, you named your father as one of four untouchable red lines. I think many Libyans would be OK with that (despite everything), however, would this redline extend to yourself and your siblings, specifically I am talking about the millions (allegedly billions) of dollars wasted by some of your siblings on various whims and personal "lust". We aspire to reach you to Libya tomorrow, which the resolution for the slogan of Change and still your letter in the celebrations of the historic youth are the hope shining future. It is obvious to us (Libyan youth) you say what you don't do, which create entrust between you and us. Your words are nice but we never see any action in the ground. we(as ordinary people) never benefit from the vast amount of money you spent in the infrastructure, our health system is the worst one in the world. Our eduction system output is zero and most importantly our legal system is unfair system. We have heard lots of promises of the so called Libya Al-gaad (Libya tomorrow). It's been now years since you told your ideas but nothing happens. Rich people get richer and poor people get poorer. Education still suffers and health is a disaster in Libya. Libyans spend all of their money to get treatment in one of the neighboring country even though, the income of a Libyan is 100 or max. 400 US $ a month and you know that. We need you to work on your people first then thinking of the rest of the world. I hope to see progress in my beloved Libya. Take care of your both brothers.